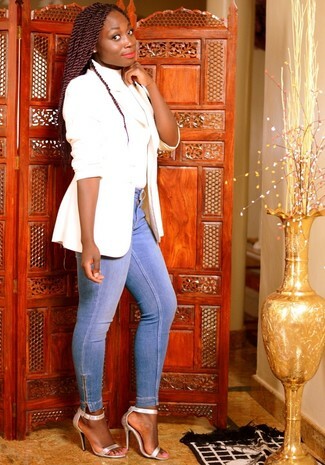 A white blazer and light blue skinny jeans are a great combination to have in your casual wardrobe. Rev up the appeal of this outfit with silver leather heeled sandals. This combination of a blue leather biker jacket and beige floral skinny pants is put together and yet it's easy enough and ready for anything. And if you need to instantly class up your look with shoes, why not complete this look with AGL silver leather heeled sandals? Opt for a blue sheath dress to assemble an absolutely stylish and modern-looking outfit. The whole ensemble comes together when you introduce a pair of AGL Sandal from Nordstrom to the equation. Choose a gold sheath dress for a seriously stylish look. Introduce a pair of AGL silver leather heeled sandals to this getup and the whole getup will come together perfectly. You'll be surprised at how easy it is to get dressed this way. Just a black lace sleeveless top worn with black dress pants. And if you want to easily class up your outfit with a pair of shoes, add a pair of AGL Sandal from Nordstrom to your ensemble. For a classic-meets-cool outfit, try pairing a grey fur jacket with a silver sequin shift dress — these two items fit perfectly well together. Introduce silver leather heeled sandals to this getup et voila, your ensemble is complete. Dress in a yellow chiffon evening dress for absolutely gorgeous attire. Rounding off with a pair of silver leather heeled sandals is a fail-safe way to infuse a fun touch into this ensemble. Marry a silver trenchcoat with a white cami dress and you'll look chic anywhere anytime. The whole ensemble comes together brilliantly when you add AGL Sandal to the equation. Consider wearing a silver sequin sheath dress to look stylish anywhere anytime. A pair of AGL silver leather heeled sandals is a nice choice to round off your ensemble.